From 25-27 November 2015, representatives of the local communities of the municipality of Mariarano, Madagascar, came together to discuss their aspirations and challenges regarding the valorization of Cinnamosma fragrans, and to exchange views with other actors involved in the value chain. The communities explored the advantages and possible elements of a Community Protocol to clarify conditions for access to their resources and benefit sharing, and to facilitate dialogue with commercial users, researchers and government authorities. The meetings took place in Mahajanga and were organized by the GIZ “Programme d’Appui à laGestion de l’Environnement” (PAGE) with input from Natural Justice. Madagascar is currently developing its national framework to implement the Nagoya Protocol on Access to genetic resources and Benefit Sharing (ABS). 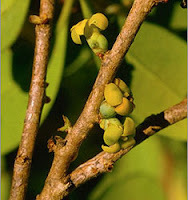 Cinnamosma fragrans, locally known as "Mandravasarotra" or "Motrobe", is one of the most sought after medicinal plants in the region of Boeny, in North-West Madagascar. It is used traditionally to treat a number of diseases and sold on the national and international market as an essential oil.